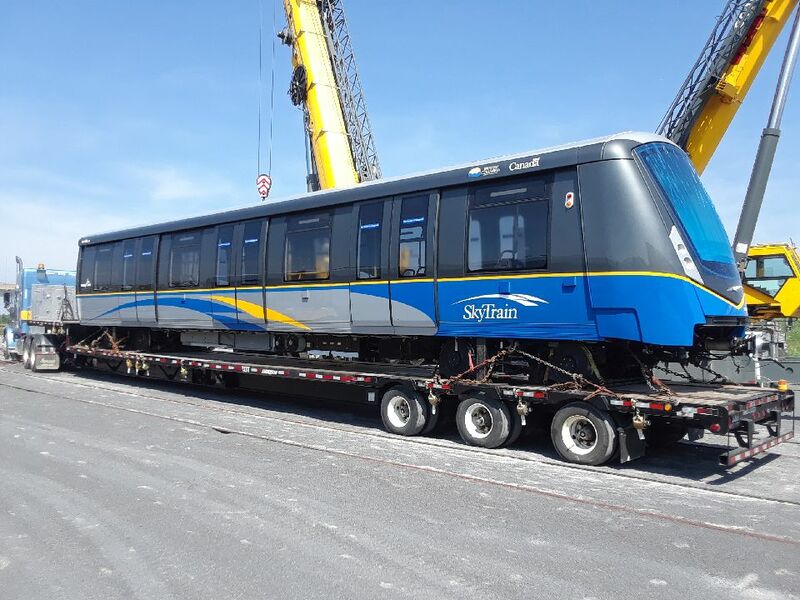 The Buzzer blog » New SkyTrain cars are on their way to Vancouver! Keep your eyes peeled on the our Twitter account where “Marky” will be sharing postcards with us from their cross-country trek! If you spot Marky, share your shots and tag us on Twitter, Instagram and Facebook using #MyTransLink. Twenty-four additional cars will arrive by early next year and another 28 by the end of the same year, for a total of 56 cars for the Expo and Millennium Lines. These trains are similar to the 28 SkyTrain cars that arrived in 2016. For the Canada Line, 24 SkyTrain cars are being built by Hyundai Rotem, and will arrive by the end of 2020. These additional 80 SkyTrain cars will increase capacity by about 10 per cent for Expo Line, 23 per cent for Millennium Line and 30 per cent for Canada Line. This results in a total of 8,200 additional spaces per peak hour on both directions on all three SkyTrain lines. This is just the beginning! In Phase Two of the 10-Year Vision, we’re adding an additional 108 new SkyTrain cars to provide increased service on the Expo and Millennium Lines, as well as 50 new SkyTrain cars to replace aging fleet. UPDATE: Marky arrived the evening of September 12, 2018 and was unloaded the next morning. Watch the time lapse! This is nothing short of awesome. Just make sure to name one Sarah for ^SK and another BadAssBowinn for blatantly obvious reasons. “These trains are similar to the 24 SkyTrain cars that arrived in 2016.” – should be 28, not 24. Also, any news on whether these 28+28 new cars will be numbered 429-456 and 457-484, or in new blocks entirely? Hi Brian, thanks for keeping us on our toes! You’re right, it is 28 cars. I’ve updated the post to reflect that. The first four cars are numbered 429, 430, 431 and 432. Lets hope this batch of the MK3 dont have the same propulsion faults, VOBC software glitch and other design flaws the current ones had. “as well as 50 new SkyTrain cars to replace aging fleet.” does this mean the 1991 500-600 series and 1995 700-800 series MK1 are going to be retired? Please give some chance to Surreu commuters as well. I comute five days a werk from Surrey to vancouver .80 % are 70s cart noisey like hell. Do you have plans to put the mark III cars on the millenium line? I would love that as i love riding the mark III trains. Another question was related to skytrain capacity; two car trains on the millenium lines get full very quickly during peak hours. I would love to see 4 car trains on the millenium line as it would increase passenger comfort and capacity. Hi Ishan, thanks for your feedback. Definitely, passenger comfort is paramount! Here’s what I can tell you, as I noted in the post, we expect the new SkyTrain cars will mean a 23 per cent increase in capacity for Millennium Line, so some relief is on the way. Are these the cars that go 1 end to the other end? Hi Kelly, that’s correct — these are the cars that you can walk from one end to the other. Damn near time for the Expo line upgrade on cars. Translink should study the Toronto TTC as, a subway. Cars are soooo quiet and no screeching of wheels or jostling of commuters. Canada line is fantastic. Line cars and 50 replacement cars. As for five-car Mark III trains, we’ll be looking at it as part of maximizing space for our customers onboard SkyTrain. Hopefully this helps! Why are these not being built locally??? Seems shortsighted and utterly ridiculous to transport across the country!!! Hi Steve, here’s what I can tell you – an open procurement process where many factors were evaluated to ensure the best use of public dollars, and Bombardier was the successful applicant and their operations are located out of the province. How do these new SkyTrain cars work on the Canada Line which uses a different propulsion technology? Hi James, the SkyTrain cars for the Canada Line will be built by Hyundai Rotem and will be built to the specifications for the line.